The new Negroni Trolley at Cartizze brings the drink of summer to your table. Nestled along a cobbled back street in the heart of Mayfair lies Italian-influenced cocktail and Bellini bar, Cartizze. 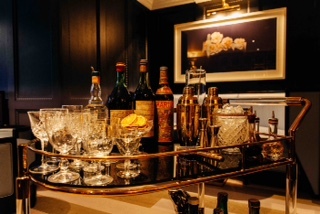 I was invited along to try Cartizze’s newest addition, an antique Empire-style drinks trolley where a variety of Negroni twists are mixed to order. The Negroni is rumoured to have originated in Florence back in 1920 when Count Camillo Negroni asked for his Americano cocktail with a kick. Gin was added, and the Negroni was born. The Negroni is the cocktail of the moment – strong, complex and refreshing. The Cartizze Negroni contains Portobello Gin, Antica Formula, Campari, Aperol and Martini Rosso. This twist on the quintessential Italian aperitif delicately balances bittersweet, sharp and herbal flavours. I found it far too drinkable. It was sipped in minutes. For those seeking a sweeter flavour the waiter will suggest the Grapoi Negroni, which is sweetened with Cointreau and clarified grapefruit juice. The most tempting drink on Cartizze’s Negroni menu, and not just because of the £50 price tag, is the Vintage Negroni. Made with exclusive 1960’s Carpano Vermouth, Antica Formula and Martini Rosso, it is the smoothest of them all. Cartizze bar celebrates the timeless Negroni in fine, elegant, art-deco style. Time to get trollied.